Business View Caribbean interviews Graham Proverbs, General Manager of Ready-Mix Limited, Barbados, for our focus on best construction companies in Barbados. 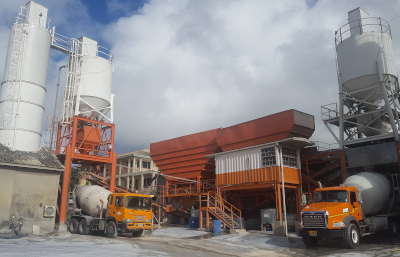 Ready-Mix Limited, Barbados, is ‘pumped’ to celebrate the company’s 50th Anniversary in 2019, and looking towards new, more sustainable processing and construction methods to meet growing customer expectations and ever-evolving technologies of the industry. A niche supplier of concrete ready mix, concrete blocks, and Omnidec floors for the residential and commercial market, Ready-Mix provides the most efficient solution for concrete supply – making it the go-to choice for long-term customers and the preferred option for new clients. 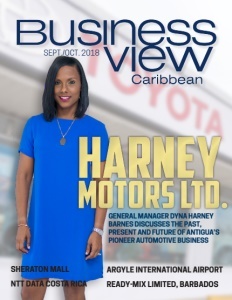 Business View Caribbean recently spoke with Graham Proverbs, General Manager of Ready-Mix Limited, Barbados, about his insights into the current state of the construction industry on the island and his company’s strategy for success. Having been with Ready-Mix Limited for almost four decades, Proverbs has seen the company survive when times were lean and thrive when building was booming. The following is an edited transcript of that conversation. BVC: Congratulations on the upcoming 50th Anniversary of Ready-Mix Limited. Could you give us an overview of the company’s background? Proverbs: “Ready-Mix started in 1969, followed by Ready Block in 1971. The parent company, Ready-Mix Holdings Limited, owns those two subsidiaries and a few smaller companies in the condominium rental business. That came about when we supplied materials to the companies building the condos – they supported us by giving us the work and we, in turn, supported them by buying condominiums that we rent out as an investment. They aren’t big income earners, but they pay for themselves, so it doesn’t cost us anything to have them. BVC: Can you describe your operations; do you deal with residential and commercial builds? Proverbs: “We’re probably the largest block and concrete manufacturer on the island and we work with anybody who wants concrete – both commercial and residential. We have quite a few contractors who deal with us and us alone. They know that our quality is good; there are other suppliers out there whose quality is not as good as ours and they try to undermine us in price. But the contractors are pretty loyal to us. As they say, ‘you scratch my back, I’ll scratch yours.’ In hard times, when people have difficulty paying their bills, we’ll hold their credit for awhile until they can catch up. Thankfully, the people we’ve done that for have stayed with us all these years. “Concrete is our major revenue producer. Omnidec is only used on specialized projects. Although, it does speed up the process by replacing the form work and you need a lot less propping. Instead of every two-and-a-half feet, you put the props every eight feet. That cuts down on costs for saving private individuals who don’t own their own props, because they don’t have to rent as many. BVC: What is the biggest challenge for the construction sector on the island? Proverbs: “Competition. Right now, there are a lot more people out there producing the products. Building has been slow here for the last three years because of the global downturn. We tend to rely on the European and American markets – people coming here to invest and so on. It’s picking up now in many of those foreign countries, but it takes a while to trickle down here to Barbados. “There is a lot of development going on here in the hospitality sector. We just cast the roof on the Crane Hotel. They also have a 36-unit housing project in a different location that will be ongoing over the next couple of years. Depending on how those sales go, they’re looking to put multi-story timeshares there, as well – another three big timeshare buildings. “St. Lawrence Castle has started construction, but we’re still trying to get in there with our product. We’ll get some work, but one of the contractors has their own concrete manufacturing plant, so we won’t get that part of it. The Hyatt has been on the drawing board for awhile; hopefully, it will start at the end of 2018 or early next year. Then there is the Sandals Hotel chain. We’re hoping one of the contractors that works with us will get the job to build that one, but the tenders haven’t gone out yet. We’ve also done work at the Bridgetown Port; we supplied some of the piling, but that project has been put on hold. 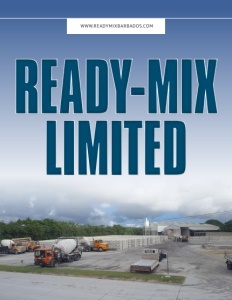 BVC: How does new technology affect Ready-Mix Limited? Proverbs: “Our original concrete plant was run manually, where you pushed a lot of buttons to open and close gates, move materials, etc. Then, 10 years ago, we bought a second plant that came totally computerized. After running that for a while, we decided it worked wonderfully. There was less room for human error. So, we converted our new plant to be fully computerized, as well. Now, if you want a particular strength and quantity of cement, you just tap on a computer screen and say, ‘Batch five meters of 3750 psi,’ hit start and it does everything itself. 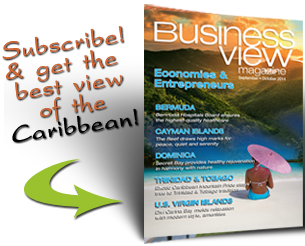 BVC: How do you see the construction industry evolving in Barbados? 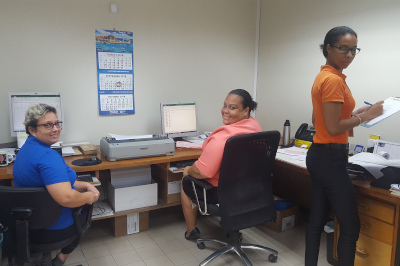 Proverbs: “After 10 years of decline, we’ve just had a change of government in Barbados and, normally, when this particular party is in power, most people tend to have more faith in them and the construction industry tends to boom. So, we’re hoping that this time around the same thing happens. Whenever they’re in power, this government encourages foreign investors to spend money here, with people building massive houses worth 20 to 70 million dollars, each. That is a great help to us because we depend on foreign exchange, since we have to import most everything except limestone for our manufacturing. “We’re keeping our equipment and systems up to date so that we’ll be able to continue providing the excellent quality of service and product that we’re respected for now. Our competitors might give better pricing, but the quality of their product is not as good as ours, and we give much better service. That carries you a long way. And our name is well known – Ready-Mix is synonymous around the world with concrete. Check out this handpicked feature on Elegant Hotels – Barbados.